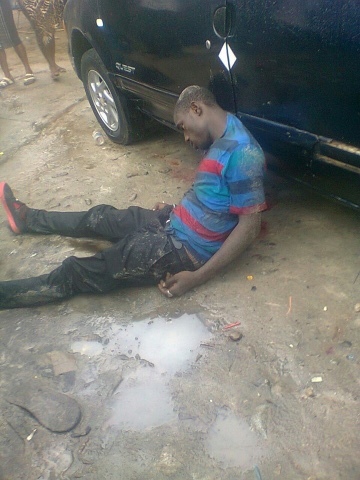 Photos: Popular Blogger Allegedly Shot Dead By The Police! 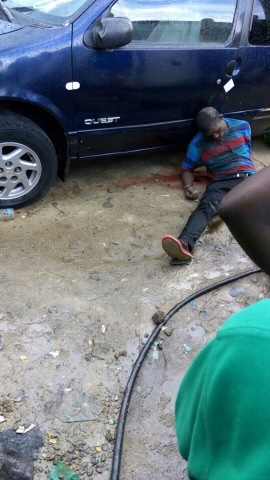 The photo of a popular Port Harcourt blogger allegedly shot dead by the Police for smoking marijuana has emerged online. The gory photos were posted on Facebook by one Barry Festus who claimed that the blogger, identified as Chukwuebuka Isidore, the publisher of Ghost Mode blog had helped his career with his blog. It was gathered that the Isidore was shot while attempting to escape arrest by the police somewhere close to Azikiwe, mile 2 Diobu Port Harcourt where he and some friends where seen smoking. Festus who posted the photos on Thursday called for justice for the slain blogger. In the photos, the blogger was seen head bent down with back to a blue car. The wet ground around him also appears to be stained with blood.